FILE - U.S. President Donald Trump gestures before delivering the keynote address at Liberty University's commencement in Lynchburg, Va., May 13, 2017. The university is producing a movie about a prophecy concerning Trump's election. The author’s “claims to have received prophecies directly from God ... do not align with the Bible’s message,” states the petition signed by more than 2,000 respondents. 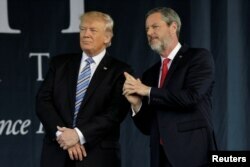 President Donald Trump, left, stands with Liberty University President Jerry Falwell Jr. after delivering the keynote address at commencement in Lynchburg, Virginia, May 13, 2017.